Preparing duck breasts confit-style is the problem. Such tender cuts as poultry (chicken, turkey, duck, goose, etc.) breasts are best prepared as you would tender pork or beef. I cook migratory-bird (duck, goose, etc.) breasts at 135F (57C) until pasteurized (see other posts); I cook non-migratory-birds (chicken, turkey, etc.) at 140F (60C) until pasteurized (see other posts and my guide). I only braise or confit tough cuts of poultry---such as legs and thighs. I hope that answers your question. I put this post on the dinner thread. Click on the link to see the picture. Finished sous vide cooked pork fillet by putting sliced fig on it, wrapping it in pancetta and searing in a very hot frypan so the pancetta cooked. Worked like a dream. I need some help. I've never been able to do poultry. I can do beef, fish, pork, everything else. Is there a solution to prevent the moisture from leaking out or to put it back into the meat when it spills over into the bag? 80 Centigrade? 176 Fahrenheit? 10 hours sv? I'd guess that you got the 80c for 10 hours from a conventional (oven) recipe. There's a very important translation that has to be done for sv, because the heat flow is so different. Thanks! That makes a lot of sense. It didn't even cross my mind that breasts would be that much different from legs (I'm quite inexperienced in poultry). I suppose that's one of the first things to learn with SV cooking. Tender meats -> short time just to reach the temp you want, tougher meats -> long time to make them tender. It seems obvious but somehow I missed it. I suppose the second thing to learn is which cuts are tender and which aren't. I'm going to see if I can find a nice orange sauce and try the other breast at a lower temp for a shorter period of time. This forum is such a great resource. I tried duck confit today using a Hudson Valley moulard breast cut in 1/2s. I followed Douglas' method and brined it for just over 3 hours in a 7% solution that also had some herbs and a little bit of orange juice (no orange slices but I figured that would work). I forgot to wash the breasts after (that might be my mistake). I put them in a bag with a couple slabs of duck fat and threw it in at 80c for 10 hours. At first the bag looked fine, lots of fat and duck. After a few hours I began to see red juice in it. I took them out, let them rest 5 minutes or so, and seared them and had them with some mushroom risotto (first time doing that as well, and it turned out amazing. I was worried since I've never even had risotto before but according to my friend that tried it the texture was almost dead on). They were pretty darn tasty, but dry. A few bites took some trouble to swallow properly. What did I do wrong? The same thing happened when I tried chicken. I feel like poultry should be the easy thing to cook but I can never get it moist, even when the juices are sealed in the bag with the meat. I have had great success with chicken breasts and with moulard duck breasts from Hudson Valley Fois Gras. I do them at 57.5C for as little as 45 minutes and as much as an hour and 15 minutes. I remove the duck skin and it gets crisped like bacon on top of the stove using a bacon press. You can also crisp the skin in the oven with parchment - by putting the skin between two cookie sheets. I have brined the breasts or not - they always come out juicy and perfect. I have marinated the duck breast or not - they always come out tender and tasty. Frankly, I like the non-brined/non-marinated versions the best, but note that for chicken I am using all natural, pastured, farm fresh chicken. Check out my post #3411 in this thread. Beware microbes in poultry ! 57.5°V/45min is way below pasteurization times according to Douglas Baldwin's table 4.7 (see http://amath.colorado.edu/~baldwind/sous-vide.html ). With your "all natural, pastured, farm fresh chicken" this may be OK, but poultry in general has a very high chance to be contaminated with Salmonella and Campylobacter et al, and under certain circumstances these may even migrate into intact muscle meat (see http://www.reeis.usda.gov/web/crisprojectpages/196957.html ), so to everybody else I strongly recommend to strictly adhere to pasteurization conditions in cooking poultry. It seems to me after re-looking at this chart that I need to put my temp back up to 58C (not 57.5) and keep my time at 1.25 hours minimum. If I may add one additional point on this question. If you are playing at the very margins of temperatures for pasteurization, you'd better buy yourself one of the extremely accurate calibration thermometers that Pedro uses to ensure that your water is kept at the right temperature. There is also the question of a drop in temperature when you add the meat as well as problems related to water circulation that can lead to variances in temperature. Personally, I don't cook chicken below 60C and leave it to cook for two hours. Moreover, I am quite happy with steak cooked at 57C. They are both juicy, tender and do not require pushing the envelope. For fish I am likely to push the boundaries more but only cook it very briefly and make sure I purchase extremely fresh and well handled produce. I don't have a water bath or anything that's accurate. has anyone had success with braises that don't require such accurate control of temperatures? I'm thinking of sticking my bags submerged in water and then into my oven at 70c or so. For water temp. 55°C I had to set the oven temp. to about 70°C, for water temp. 77°C you need oven temp. above 100°C; as in traditional braises, water evaporation will prevent the water bath to go significantly above 80°C even with higher oven temperatures. I wonder where they got their numbers. According to the USDA tables that I have, it takes up to 82 minutes to pasteurize chicken at 58C. They have different tables based on the fat content of the item being pasteurized. If the fat content is low enough and you don't have any fat in the bag, it can take less time -- but I think it is best to be safe. But since most people don't know the fat content of what they are cooking, it is my understanding that it is recommended to use the most conservative table. It may take far longer than 10 minutes for the meat to get up to temperature. It all depends on thickness. It would take a one inch thick chicken breast just under 37 minutes to get to temperature. Nathan posted tables that you can use to determine the time that it takes a particular thickness to get up to temperature. I recommend finding them and downloading them -- or using Doug Baldwin's tables. So, to pasteurize, a 1 inch thick chicken breast takes about 119 minutes (two hours). Btw, I don't believe that natural or organic poultry is significantly less likely to have salmonella. A lot has to do with the butchering and whether they manage to get the entrails out without them becoming pierced at all. A very large percentage of poultry tested in markets has salmonella. (An awful lot of what people call 'stomach flu' is salmonella poisoning, btw). My suspicion is that these numbers might vary somewhat, depending on your oven and pan. A fan oven is going to give more evaporation, but also greater heat transfer. Anyway, any sort of thermometer (meat roasting or jam-making for example) that is not going to be damaged by being in a low-set oven, is going to give you a pretty fair idea of what temperature your water bath is actually achieving. Btw, I don't believe that natural or organic poultry is significantly less likely to have salmonella. Actually, the opposite is true. Several studies have been done on this and organic poultry is much more likely to have salmonella than conventionally raised poultry. Below is the CR article. There have been several others with similar findings. [C]hickens labeled as organic or raised without antibiotics and costing $3 to $5 per pound were more likely to harbor salmonella than were conventionally produced broilers that cost more like $1 per pound. Salmonella incidence in Foster Farms, Tyson, and Pilgrim’s Pride was 3 percent, 5 percent, and 8 percent, respectively--notably lower than in the organic and no-­antibiotics types, which had an overall incidence of roughly 25 percent. In the organic/natural craze, many people have forgotten that a lot of the unnatural additives and treatments were added to get rid of dangerous naturally occuring elements in food (e.g. antibiotics). Ed: to add additional quote. Sous vide in original plastic packaging? I have had great success with SV prep of steak, salmon, chicken etc . . . as well as pork tenderloin. In all cases I have used the Ziploc vacuum bags with the manual air extractor. I am holding a Hormel pork tenderloin, packaged in heavy vacuum sealed plastic. Is there a reason NOT to just drop this into my SousVideMagic-controlled slow cooker? Is there something about either the composition of the plastic or its thickness that would make it inappropriate? 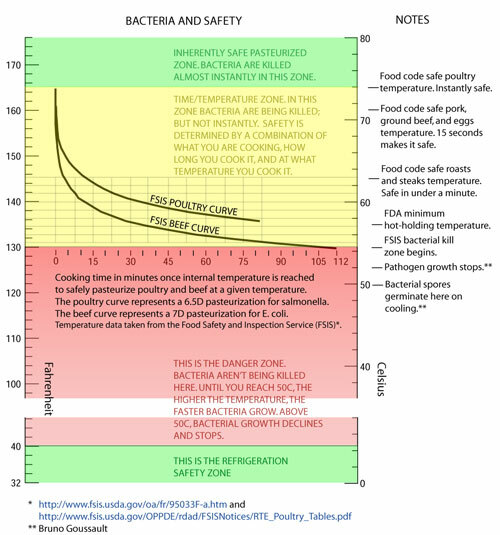 The link to the pasteurization time charts is broken, here is one that works: http://www.cookingissues.com/primers/sous-vide/purdy-pictures-the-charts/#more-3911 or http://www.cookingissues.com/wp-content/uploads/2010/02/bacteria_time_temperature2.jpg or http://www.cookingissues.com/uploads/Low_Temp_Charts.pdf (note: the editor will include a dot directly following an URL, so always type a blank after an URL). USDA pasteurization times are holding times after core temperature has been reached, Douglas Baldwin took into account that pasteurization starts at lower temperatures than the final core temperature, so with higher core temperatures pasteurization may be done before the final core temperature is reached. USDA pasteurization times are for a 6.5D (7D in poultry) reduction of Salmonella spp. (D[60°C] = 1.73 minutes) whereas Douglas calculated his tables for a 6D reduction of Listeria monocytogenes (D[60°C] = 2.85 minutes). (See http://www.hi-tm.com/RFA/food-path-summ.pdf ). Conclusion: it is safer to use Douglas' tables (3.5 / 4.7 / 5.8), and it is simpler as you do not need to add heating time and holding time. But beware, with slabs thicker than 25mm and temperatures higher than 60°C, pasteurization times may be shorter than the time to reach your desired doneness, so always consult table 2.3 as well. I did this several times, e.g. bacon in the original plastic bag for 3-4h at 78°C, ditto with sausages. No problem so far. With pork tenderloin you may not want to exceed 52°C, should not make a problem in the original bag. Food is usually packed in PA/PE or PE which have no additives, and no longer in PVC (with phthalates as plasticizers which give the typical "plastic odor"). I used a dual-sensor-thermometer "http://www.outdoorchef.com/index.php?nav=4,43,67&prod_id=1" (sorry, you have to copy-paste the link, as the editor would break it at the comma) for the oven - waterpot - method; knowing that it was wrong by 1°C. This showed me the oven temperature and the water temperature. http://www.mastrad.fr/art.php?id=441 worked as well. However, avoid bimetallic coil thermometers, they are not a satisfactory device for measuring food temperatures, see http://www.hi-tm.com/Documents/Bimet-pic.html . Terrific! Although I usually want to add my aromatic bits and pieces to the bag, an occasional simplification is welcomed. On a related topic, I have done my previous pork tenderloins to a somewhat higher temp, closer to 60/140. I've been collecting various temp charts, Keller, Baldwin, etc., etc. Do you know of a compendium that you rely on? I find Baldwin's concerns re safety lead to higher recommendations than others, have found some salmon reco's (e.g. 46/115) far too rare for my preferences (I'm now at 51.5/125). How are you approaching this? Again thanks for your response re the packaging! ...have found some salmon reco's (e.g. 46/115) far too rare for my preferences (I'm now at 51.5/125). How are you approaching this? One thing about cooking at the lower temperatures as well is that the salmon tastes lukewarm, which can be unappealing for many people. For this reason salmon is the one item that I cook at a higher temperature than the end temperature and carefully time the cooking. Try 68C for seven minutes. This will give a reasonable core temperature while leaving the fish itself at a serving temperature people are more comfortable with. One thing more, if you are vacuum packing salmon, make sure that you treat the fish lightly. If it compresses, it will not give as pleasing a texture. I bag salmon with minimal vacuum or just with a Ziploc bag, cook to 45-48°C, lay the bag on a cutting board and cut it open with a sharp knife on all 4 sides, remove the upper plastic layer and slide the salmon directly from the plastic into a skillet with almost smoking hot grape seed oil or rice bran oil and sear on both sides, this will automatically give a more comfortable serving temperature. Most temperature recommendations are too high, maybe for liability reasons. My preferences are 45-48°C for fish, 52°C for tender pork, 55°C for beef and lamb, 60.5°C for chicken, 78°C for bacon and sausages, and that's it. Of course always with post-searing. Cooking times according to thickness (Douglas Baldwin's tables). P.S. As I have an ISO-calibrated high-precision thermometer accurate to 0.03°C, my SousVideMagics are calibrated to 0.1°C. Without a calibrated thermometer, using 56°C instead of 55°C for long-time-cooking (48h-brisket etc.) might be a safety option. OK, now I am really confused. 52C for tender pork sounds very, very rare if not raw to me. So apropos of our recent discussion, may I assume you are not cooking it for more than 4 hours? I'm not sure I understand what "tender pork" is other than a tenderloin. Most pork chops seem pretty tough to me even when brined in a 7% brine for 3 hours before bagging (how I handle my pork chops). Also, at 52C, how long are you cooking say a 15 cm thick slab? I cooked a boneless pork shoulder for 48 hours at 60C it was still plenty pink, juicy and tender. I have done 10cm chops for one hour at 58C, I would like to do it a little less (say 57C)because the loin chops I use are so lean. What would you recommend. Thanks. Another question: Would the Thermapen or other thermocouple type digital IR thermometer be acceptable for calibration? I have, by the way, tested my SVS with about 4 different thermometers (including two digital IR thermometers, an old analogue IR type and a basic candy thermometer) just to see if the thermometers agree with the read-out on the SVS and the digital IR thermometers always agreed within .1C. New to the forum, but have read most of the sous vide topic. Question about cooking eggs. I have a SVS and have done eggs a few times at 65c. Love how they come out. My question is that I've read that once an egg is pasteurized it can be stored in the refrigerator just like raw eggs. I'm a bit confused on this. If you do this, when it's time to eat them, do you re-heat them in the SVS back to the same temp (i.e. 65c)? How long can you actually keep them in the refrigerator? The only negative about cooking the eggs is how long they take (i.e. 1 hour), but would love to have many already cooked that I could just "re-heat" and eat in the morning on some toast. I did different types of salmon as well as chilian sea bass at 60.5c timed to hit pasteurization. The wild coho tonight came out horrible dry. The seas bass was ok, other types of salmonnas well. I googled sushi grade and it seems that the term is not really defined by the fda. It also seems that if the fish was previously frozen that this wouod kill off possible parasites. So what is the actual risk if i lets say do a salmon at 50c? I know pasteurization is not really an option at these low temps since i would be in the danger zone too long. From a safety prospective, assuming i dont want to go aove 55 and pasteurize are there different levels of time and temperature that lead to higher safety? Or can i do whatever I like if i stray from pasteurization. I noted that Keller is all over the place in his recipes but he is staying far away from pasteurization. This might help: http://www.cookingissues.com/2010/02/02/coming-soon-sous-vide-and-low-temp-primer/ with pictures. "Salmon cooked at various temperatures. Interesting: fish often go through two zones of goodness: a low temp zone usually described as having a fudge-y texture, and a higher temp zone that makes a more classical texture. Fish cooked between these zones squeaks when you chew it. The exact temperature of the two zones depends on the fish itself, the season in which it was caught, the fat content, etc."